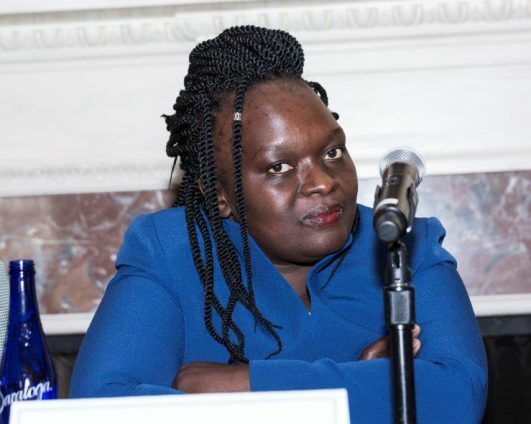 Gertrude Nyausi Angote is the Executive Director at Kituo Cha Sheria, the oldest legal aid organization in Kenya, whose mission is to empower poor and marginalized people towards access to justice. She is a human rights lawyer and social transformation advocate who has been at the forefront of litigating, agitating, and advocating for equal access to justice and human dignity for all. Angote is a trained trial advocacy teacher from the University of Washington, and serves as a faculty member and lecturer at the Kenya School of Law. She is currently a Council Member of the Law Society of Kenya and an LL.M. student at the University of Nairobi.